I've received my Beginning to Draw course in the post today, and I wanted to let you know how excited I am by it. I've only had time to skim through the CD and watch the preface, introduction and the first exercise, but already I'm so, so happy by what's included! I've been receiving your newsletters for a couple of years now and always learn something, but I still felt I needed to start right at the beginning again, being so out of practice, so I waited for this product to be ready. And now it is, it looks exactly what I'd hoped it would be: good solid explanation and demonstration of the skills and techniques, with progressive exercises to build them. I'm so pleased! Developing a rock solid foundation based on time-tested principles is the key to your success in learning to draw. Many of us have been brought up to believe the myth that artists are born not made. But the truth is just about anyone can learn to draw and paint realistically with proper teaching based on sound classical drawing methods. For centuries one of the most effective ways to learn to draw and paint was to be accepted into the atelier or studio of a master artist and train by - Watching, learning and then doing. And here is the difficult thing - finding a recognized master artist to study with who is able to demonstrate exactly how to draw, and impart verbally how they did it. If you have ever attended an art class you will have quickly found out that there are good teachers who cannot demonstrate well and there are good artists that cannot verbalize what they are doing. The secret is finding that rare combination of gifted artist/teacher who can demonstrate and explain exactly what to do and who doesn't hold anything back. Such is the dedication of internationally recognized "drawing master", Michael Britton. Observing exactly how to draw step-by-step from start to finish and having the skills, tools and language of art and drawing demonstrated and explained clearly in a logical sequence is one of the most powerful methods of learning to draw. YOU CAN LEARN TO DRAW LIKE A MASTER! Your dreams of becoming an artist can come true starting right now! A major part of learning any art form is taking what you learn in class and then applying it over and over in practice. Practice does indeed make perfect. It is by no accident that those students who practice the most, generally progress the fastest. And so your progression is not limited by anything when you learn to draw but only by how much effort you put in once you have been shown the way. Learn at your own pace, in your own time, in your own home. In a classroom situaton your progression is limited by the pace of the other students and waiting for next week's class. But when you learn from an Artacademy workshop it's like a private class from Michael to you. Michael is there with you to demonstrate and explain a point as many times as you like before you progress. And you can proceed to the next lesson as soon as you are ready. The first part of my Beginning to Draw Workshop is your Basic Training. This 2 hours program is where you develop your foundational drawing skills. Basic Training trains you to know exactly how to go about beginning a drawing, how to analyze a subject, how to measure and sight to establish the proper proportions of your subject. In a very short time you will understand how to translate what you see into drawings that look and feel three dimensional. In Basic Training you will learn to master your drawing materials - how they work, what kind of marks they make, the proper way to maintain them and which materials work best for your desired outcome and you will have tons of fun and enjoyment along the way. The second part of Beginning to Draw is Plasticity: Form & Structure. This 2-hour program begins with training you to draw single object and then proceeds to composing and drawing a multi-object still-life. 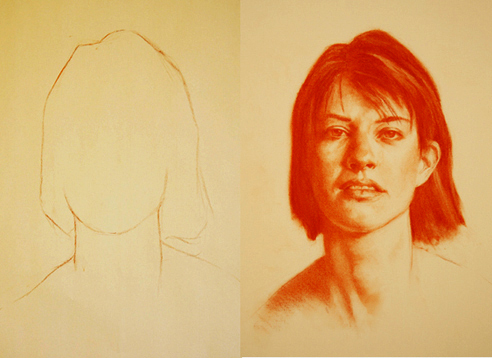 The third part is your 2-hour Introduction to Portrait Drawing. No matter how far you decide to go, learning how to draw correctly from the start and developing a rock solid foundation based on time-tested principles is the key to your success. The primary rule in drawing and painting is to always work from general to specific. The general overall impression is called the arabesque (an other term for this is contour). The first skill that you need to acquire is being able to strike arabesque correctly in terms of proportion and shape. This is a drawing skill that needs to be taught to every artist when they begin to learn to draw. Once the arabesque has been established the major landmarks of your subject are then placed. From there it is a matter of breaking down form in a logical succession. 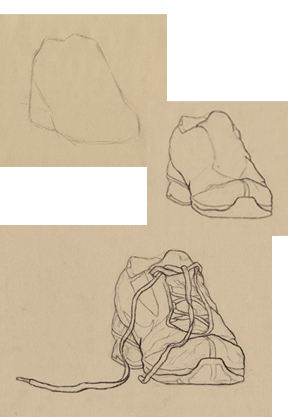 Your first skill to be acquired is to be able to readily assess simple shape and proportion. Using the lessons and skill-building exercises in my Beginning to Draw Workshop you will be well on your way to mastering drawing. 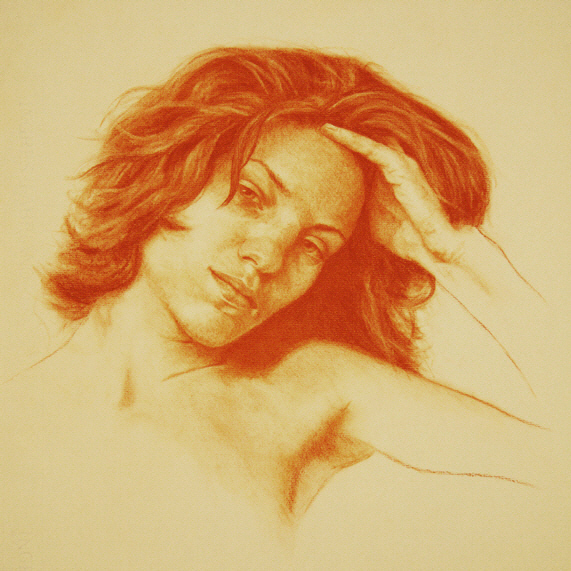 From sketching in the simple shape of the head it is only a matter of knowledge and experience (the knowledge I teach, the experience you gain by drawing) to get to a highly resolved drawing like this one which was done using sanguine conte. This is how all of the masters begin a drawing or painting. The untrained artist will always begin with a detail, such as an eye, and proceed from there; and the result will usually be the same - an exercise in frustration. This skill of sketching in the simple shape of an object or a portrait is called striking the arabesque and it is the singularly most important drawing skill you can acquire. Once you have acquired the drawing skill of accurately striking an arabesque, whether it is for portrait drawing, still-life or landscape, etc., then the interior placement of the features, or landmarks, is a relatively straight forward endeavor. There are no tricks, sleight of hand or dazzling short-cuts in learning how to draw and paint. The traditional approach of learning how to draw is to train you to actually see what you are looking at and then applying what you see to paper. This is the surest method to building a solid foundation upon which you can grow as an artist. And every accomplished artist has undergone this training at some point in their career. The workshop is accessible to everyone who wants to learn how to draw. It is a self-contained education designed for both home and class study. 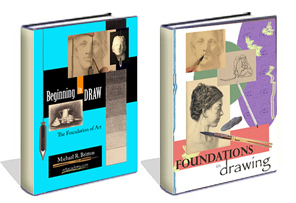 The content of Beginning to Draw is equal, and more!, to a 12-week college-level foundational art course at a fraction of the cost. Text and Exercise Ebook and the BONUS Foundations in Drawing Ebook FOR ONLY $67! Originally published as a 3-DVD set for $177 this best selling workshop was still considered an excellent value and investment.